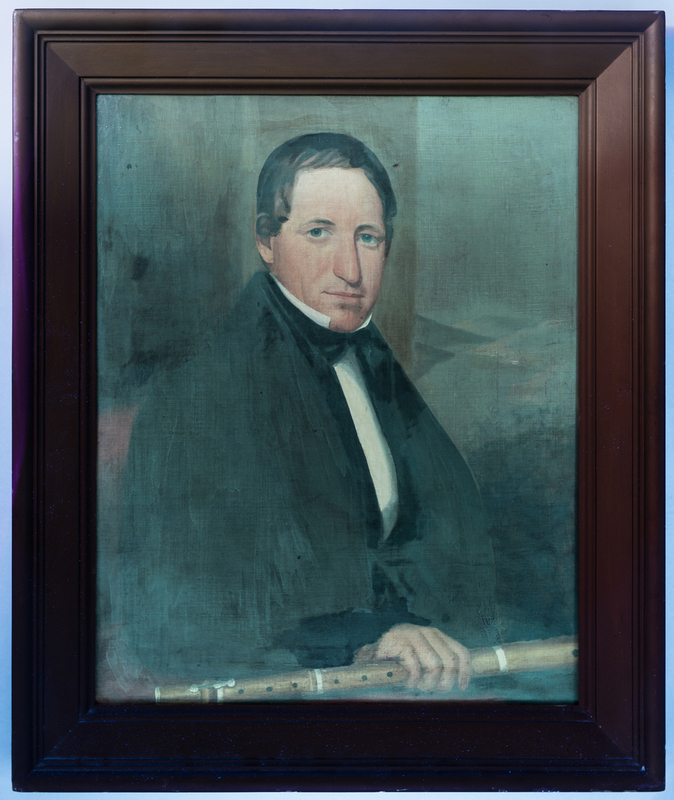 Oil on canvas portrait of Joseph Blackwell Stanton (1787-1860), founder of Stanton, Tennessee, likely painted while he was living in Maury or Haywood County, TN in the 1820s-30s, attributed to Ralph Eleaser Whiteside Earl (1788-1838) or John C. Grimes (1804-1837). 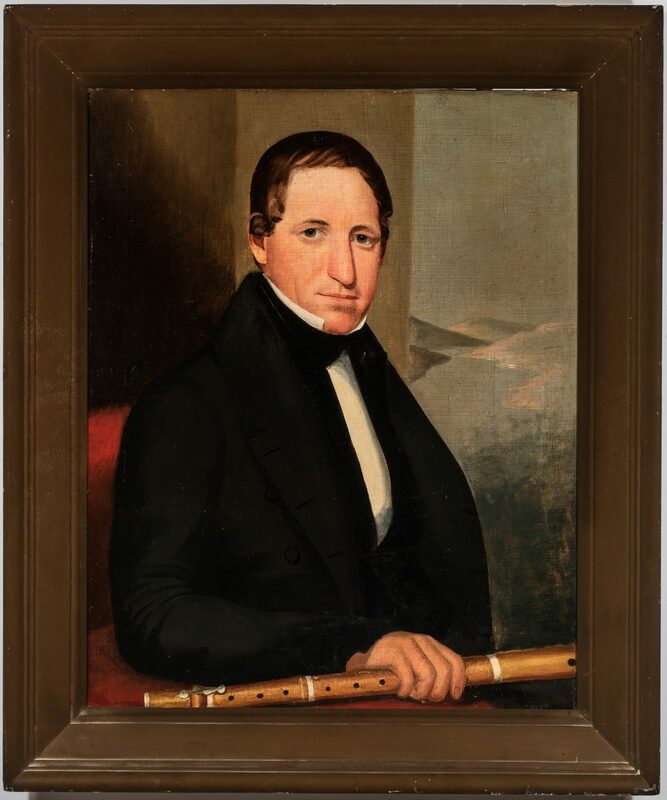 The middle aged subject is depicted wearing a black jacket and tie, and holding a flute or other wind instrument; in the background is a valley with hills or mountaintops rising up on either side and a river or clouds below. 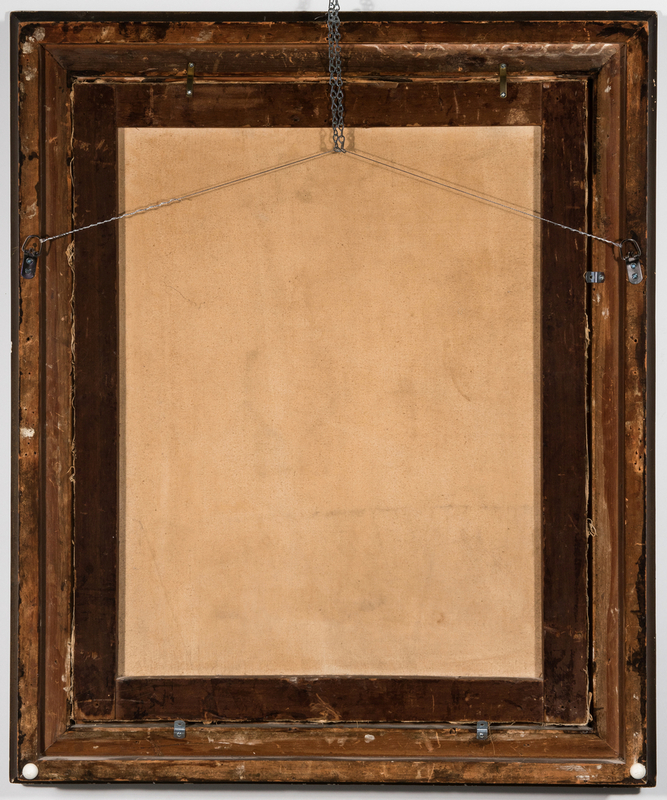 Original wide molded wood frame with later painted surface. 29 3/4" H x 23 7/8" W canvas, 37" H x 31" W frame. 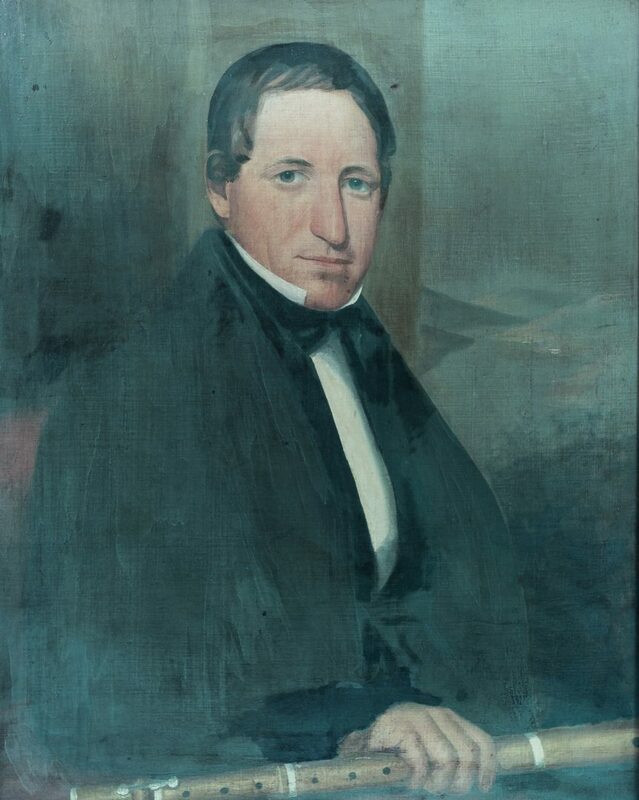 Provenance: Consignor is a direct descendant of Joseph Blackwell Stanton, a Culpepper, Virginia born man who lived for a time in Georgia, South Carolina and Maury County, Tennessee, before settling with his family on 6,000 acres in Haywood County, Tennessee by 1833. (More history on Stanton available on request). Note: according to oral family history, the landscape in the background depicts the Smoky Mountains, possibly Lindsey Gap between Cosby and Blufton. 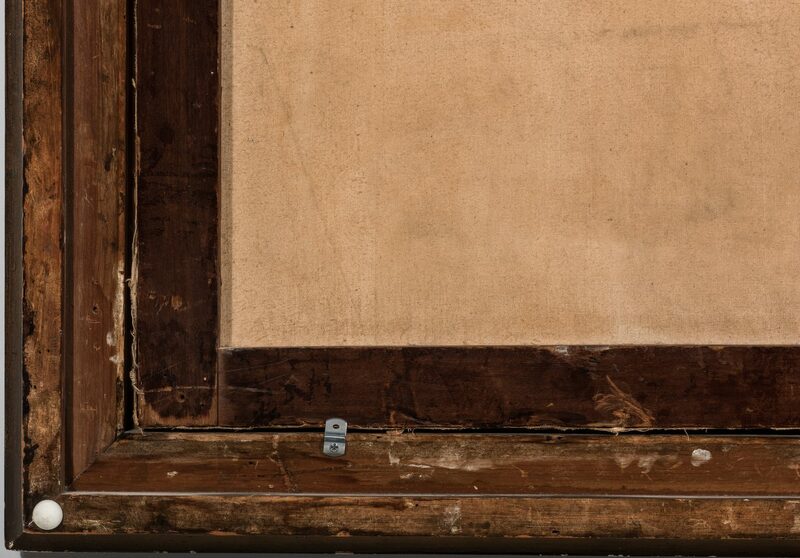 The frame was said to have been hand made by slaves on the Stanton plantation. Ref. The Tennessee Portrait Project, #1926. 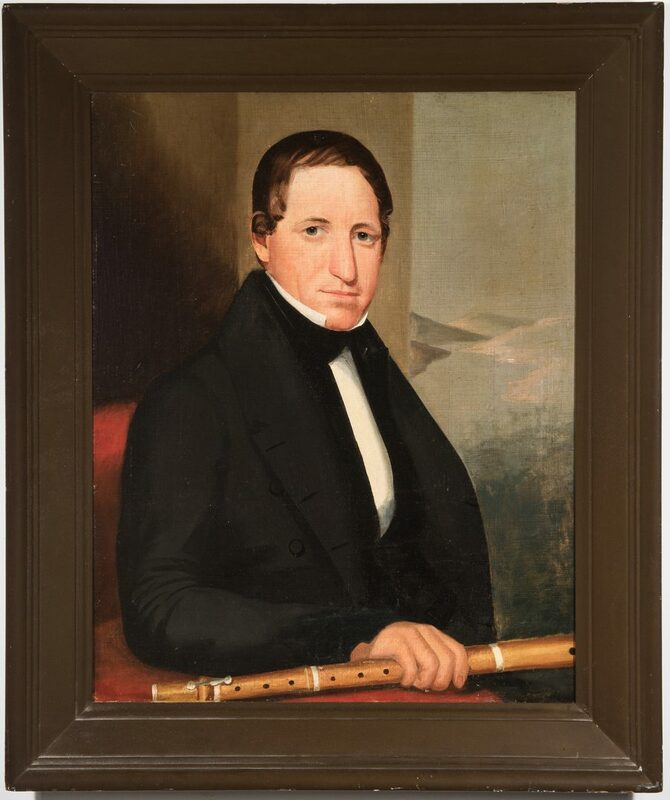 This portrait has long been attributed to Ralph Earl, but also bears some similarities to portraits by John Grimes, a Huntsville, Alabama painter whose early style is not unlike Earl's. 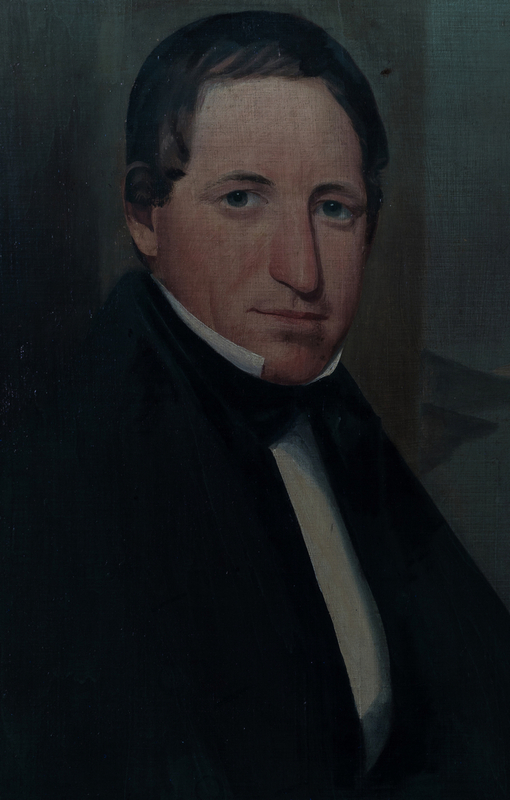 The Kentucky-born Grimes trained with Matthew Jouett and came to Nashville in about 1829, the same time Earl was departing for Washington, DC with his friend Andrew Jackson, who had been elected President. 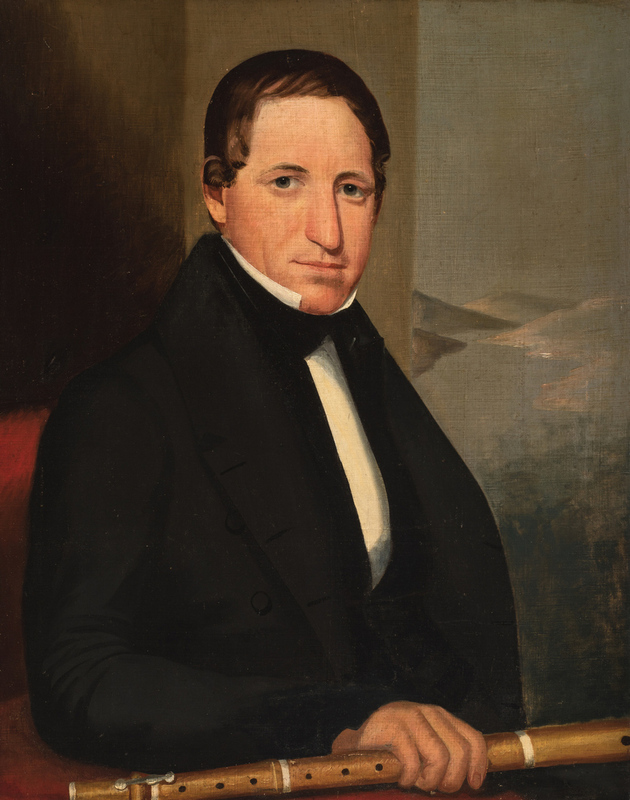 Grimes seems to have stepped in to Earl's role as the "go-to" painter for wealthy Middle Tennesseans desiring to have their likenesses painted, until his untimely death in 1837. (Source: Edward Pattillo, Alabama Heritage, No. 63, Winter 2002) Ralph E.W. 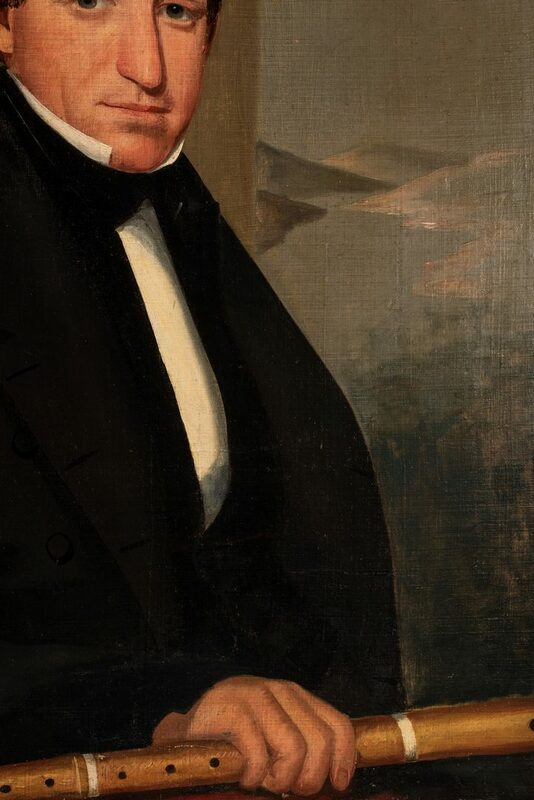 Earl studied under his father (also named Ralph Earl) in Northhampton, Massachusetts, before traveling to London in 1809 to study under Benjamin West and John Trumbull. 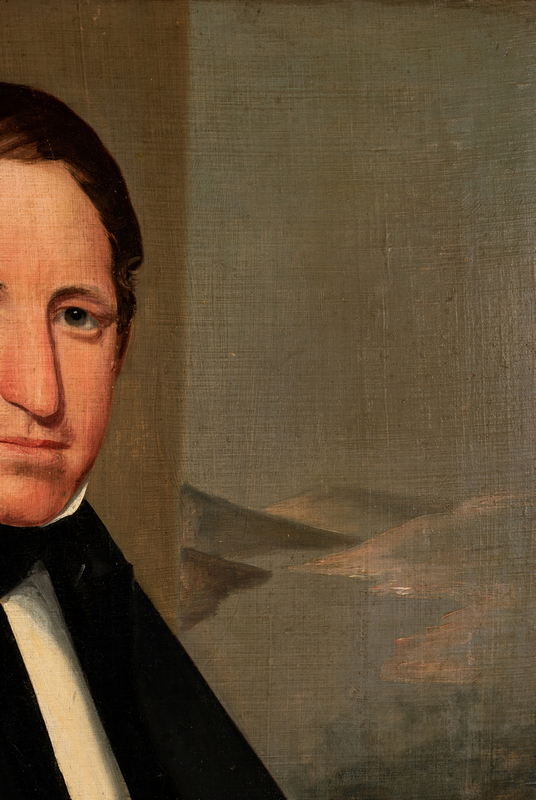 In 1817, Earl arrived in Nashville to paint General Andrew Jackson, the hero of the battle of New Orleans. 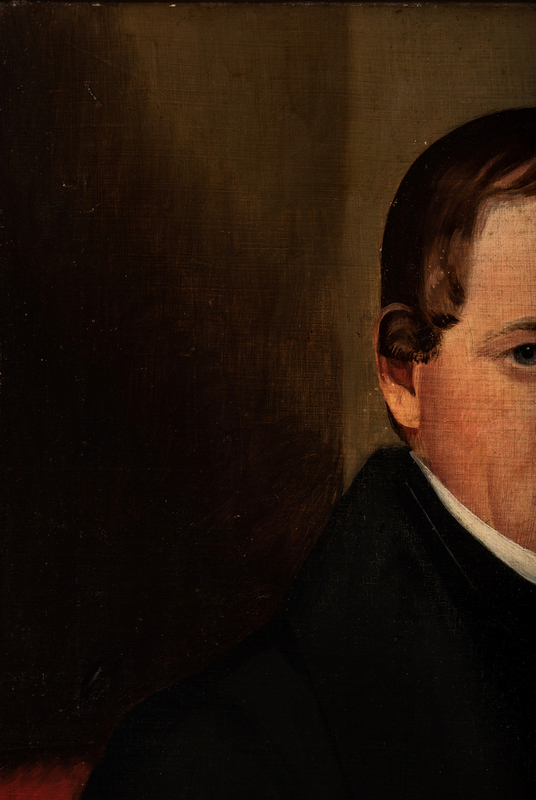 Later that year, in Natchez, he met and married Jane Caffrey, Rachel Jackson's niece. 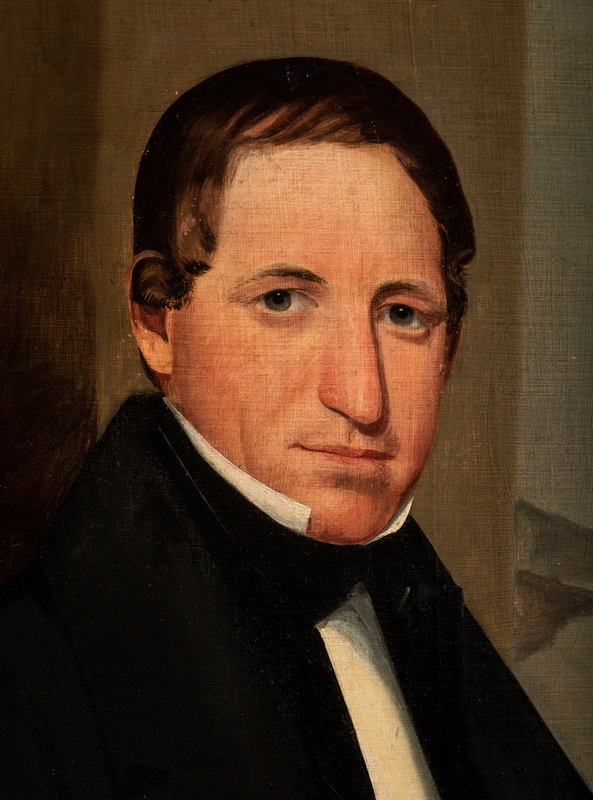 She died the next year, but Earl moved into the Hermitage and would from then on remain in Jackson's circle, accompanying the newly elected president to Washington. 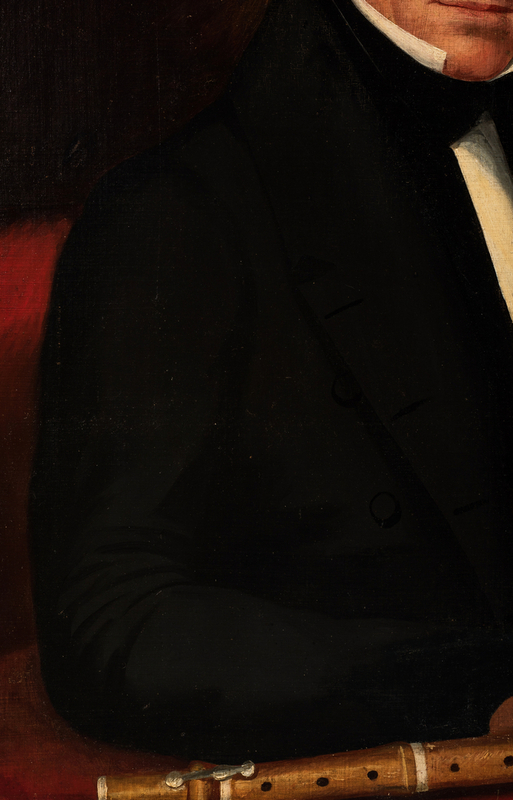 During the next eight years, Earl turned out numerous paintings of Jackson, and politicians, especially Democrats, knew it "did not hurt to order a portrait of General Jackson from Earl." 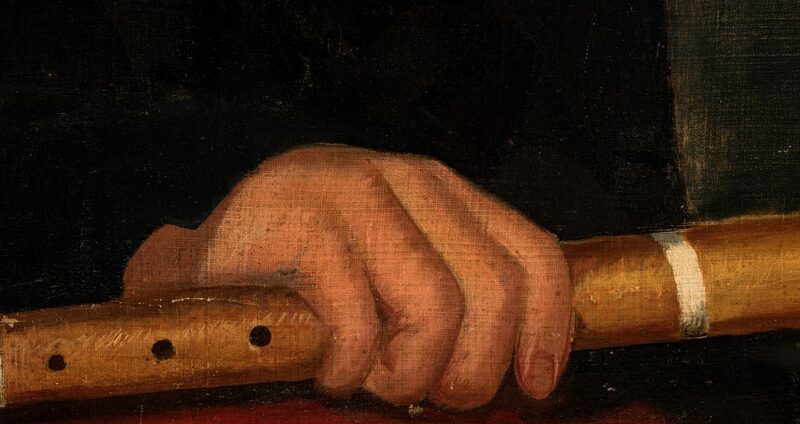 He painted many of JacksonÌs friends and a few of his foes. 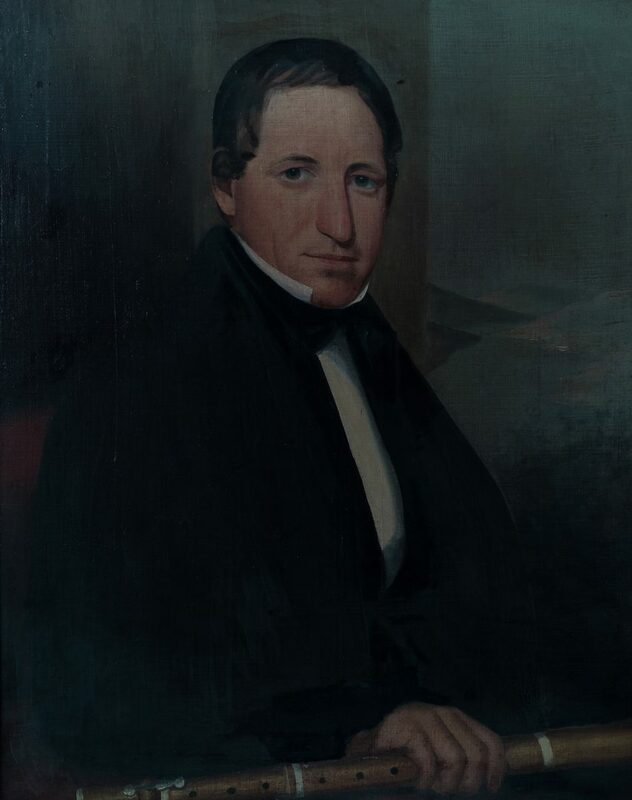 Earl returned to the Hermitage with Jackson in 1837 and died there in September 1838. (Source: James C. Kelly, Virginia Historical Society, Tennessee Encyclopedia of History and Culture, 1998). CONDITION: Lined; narrow area of paint loss 1 3/8" x 1/8" at right center edge of canvas (not visible when framed). 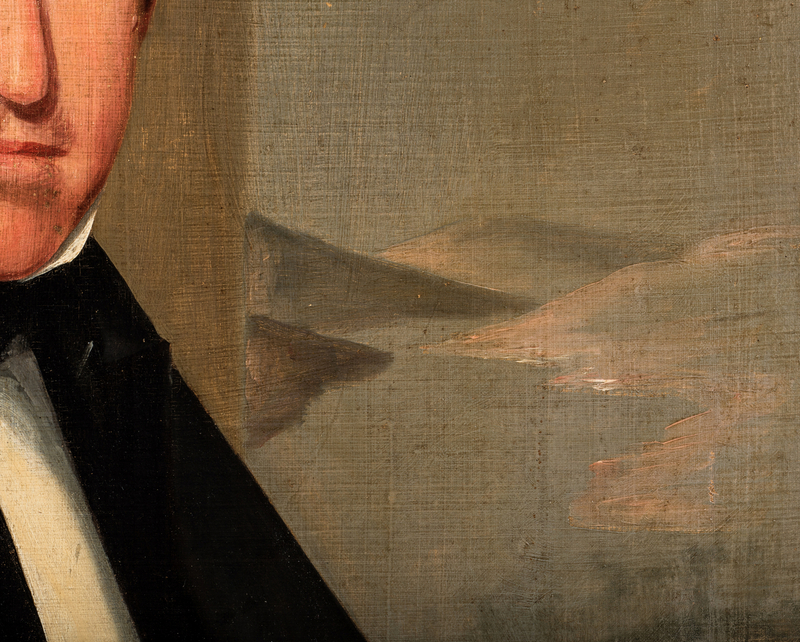 Areas of overpainting to hair at top of head, lapels of coat, and left sleeve. See black light image.